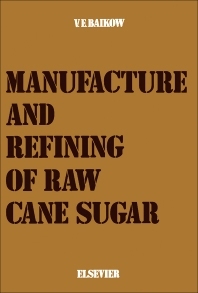 Manufacture and Refining of Raw Cane Sugar provides an operating manual to the workers in cane raw sugar factories and refineries. While there are many excellent reference and text books written by prominent authors, there is none that tell briefly to the superintendent of fabrication the best and simplest procedures in sugar production. This book is not meant to replace existing books treating sugar production, but rather to supplement them. All that is written in this book, each chapter of which deals with a separate station in a raw sugar factory and refinery, is also based on material already published and known to many in the sugar industry. The book is organized into two parts. Part I covers raw sugar and includes chapters on the harvesting and transportation of sugar cane to the factory; washing of sugar cane and juice extraction; weighing of cane juice; boiling of raw sugar massecuites; and storing and shipping bulk sugar. Part II on refining deals with processes such as clarification and treatment of refinery melt; filtration; and drying, cooling, conditioning, and bulk handling of refined sugar.